Arthritis can cause pain in your joints and lead you to slow down your workout efforts for fear of causing more pain and damage. Some exercises and workout machines should be avoided since they can exacerbate arthritis and joint pain. However, certain exercises can actually help reduce pain and stiffness from arthritis. The best exercise machines to achieve this are low-impact, promote a full range of motion and allow you to adjust both incline and resistance. While exercise is good for relieving arthritis pain and promoting healthy joints, exercise should be moderate and low-impact. That means you should avoid any machine that requires you to land hard or do jerky movements, such as certain weight machines and the treadmill when you are running. Instead, look for machines that allow you to glide or roll with each movement and limit the amount of strain and pressure on the joints. These include the elliptical trainer, stationary bike and row machine, which reduce the amount of weight your joints have to bear while still allowing a thorough workout. Adding incline to a workout may help you burn more calories, but for an arthritis sufferer, this spells serious pain. That is because arthritis is caused by loss of cartilage, which is meant to cushion the joints when you move. Exercising on an incline adds to the pressure on your joints and should be avoided when you have arthritis. The best exercise machines will allow you to adjust the incline settings so you can work out on a flat surface, without having to "go uphill" to use the piece of equipment. Many elliptical trainers allow you to adjust the incline. Treadmills do as well, but should be used for walking rather than jogging or running. Using a cardio exercise machine with added resistance makes the workout harder, but it also makes your joints have to work harder. 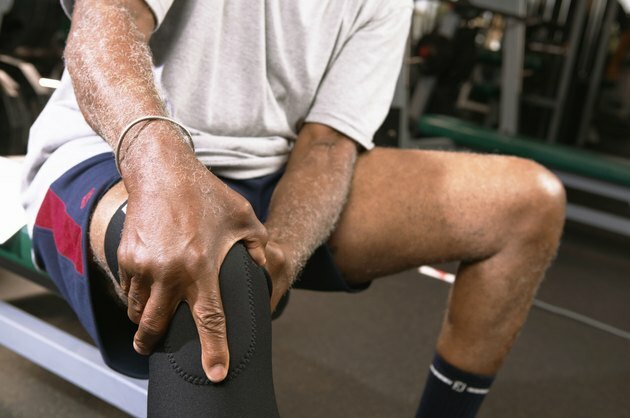 Added strain on your joints should be avoided, since it can cause more inflammation, swelling and pain. The best exercise machines for a person suffering from arthritis and joint pain is one that can be used without any additional resistance. Certain types of elliptical trainers, stationary bikes and treadmills allow you to set the resistance to zero or come without any resistance at all. Doing flexibility training can not only help relieve stiffness in your joints, but also help improve your range of motion. This is important when you have arthritis, because staying flexible means you'll have less pain when doing everyday tasks. The best machines for flexibility are those that allow the muscle you are exercising to go through a full range of motion rather than doing short, choppy movements. Elliptical trainers and stationary bikes are good for flexibility when doing cardio. When strength training, it is best to avoid weight machines since they can limit your range of motion. Instead, choose free weights that are heavy enough to give you a workout but not so heavy that they strain your joints. Fox News: Free Weights vs. Weight Machines: Which is More Effective?